Neversink Spirits was founded by two long-time friends with a passion for spirits, wine, food, and nature. Naming their Port Chester distillery, Neversink Spirits, after the Neversink River as "a tribute to New York's nature." 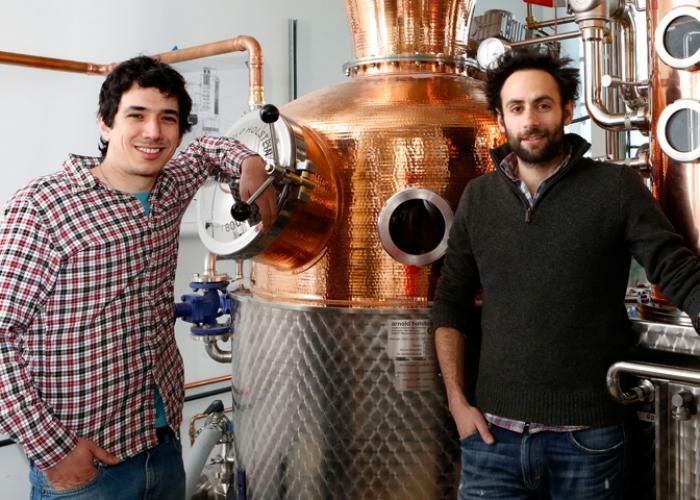 After years of tasting, tinkering, sipping and planning, Noah Braunstein and Yoni Rabino found a project in which their passions could be realized – and Neversink Spirits was born. Making spirits is their calling, apples their muse, and they finally found the vehicle in which to share their vision with their fans. A spirit's quality can only be as high as the ingredients from which it's made. When they formed a team with Camps Road Farm and Kent Falls Brewery to form a local collective known as "The Food Cycle," they knew they had found a way to make their spirits truly unique. Working together, the partners carefully developed a growing plan for the farm, cultivating ingredients specifically designed to make exceptional spirits and beers. Being able to verify the supply chain's provenance allows Neversink Spirits to make spirits of the highest quality, while minimizing the footprint on our planet. Waste from the brewing and distilling processes is recycled back on the farm as compost and animal feed, increasing the productivity of the farm and closing the sustainability loop. Apples are the cornerstone of Neversink Spirits' production. In 2012, through a grassroots effort from volunteers and friends, they planted over 350 apple trees on Camps Road Farm. Spirits produced from the over 15 varieties of apples, all difficult to obtain heritage varietals that produce excellent cider and brandies, will excite the palate with new ways to experience of America's favorite fruit. They are passionate about apples and want to share that passion.